This is not love. I know. It's an almost love--it is deeper than love, but much weaker since it has not known any perfect redemption that love provide and it is also more naïve, a tender feeling that last longer than a whole bottle of wine (which the owner tried to drown in order to forget about said feeling). But this almost love is so pretty, like poetry. Uneasy, perhaps at one point seems ethereal, and loving. So much loving. The absence of hatred that could be caused by the mutual agreement of a relationship is the most appealing part of it all. But I guess it is because I have experienced what some would have perceived as "romantic notions of a relationship" with you. We've gone to the museums together--even science museums where we tried to detect each other's heart beats but failed amusingly. We dined--lots and lots of time we ended up at my place, eating leftovers and created some unearthly food that we ate anyway. We shared secrets--nothing deep, we decided, but we knew it was enough to show that our presence were important for one another. We have shared each other's arms--protective and safe cocoon in the worst of circumstances possible. We have travelled together--not to mention you have successfully persuaded my mother to let me go on a road trip with you. We've watched movies together--horrors, your favourite, and mine, thrillers. We have made similar temporary tattoos--from the week we spend by the beach eating grilled mahi-mahi. Our touches in another's skin were some welcoming comfort--it was not foreign, like when you have once told me when there was someone else touching you, I loved (still do) the sensation of being touched by your being. Especially when we were being incredibly clingy. You were endearing, lovely, exquisite, rare and kind. Even though we aren't anymore. 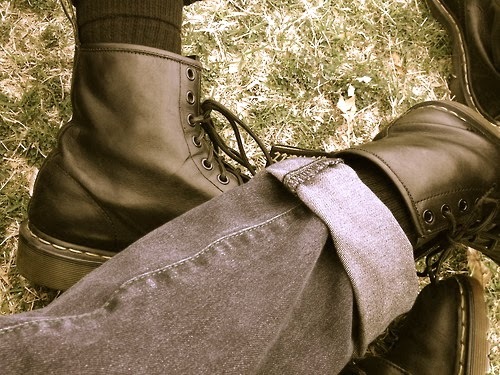 You are currently reading Leather Boots and Jeans at Thunderloved.